Hypodontia-missing teeth, baby teeth, spaces, implants, orthodontics, restorative dentistry : What can I expect from Orthodontic treatment ? Review on orthodontic new patient clinic where we chat about what you want to gain from treatment. We take records including photos and models of your teeth. Attendance on multidisciplinary Joint clinic: where all members of the team listen to what you want, look at your teeth and face, examine your models and x rays and discuss your treatment plan. Consent for treatment for the option chosen by the patient. All risks and benefits to embarking on the chosen course of treatment will be discussed at length. Orthodontic treatment may necessitate fixed or removable braces which then need adjustment every 6 weeks for approximately 2 years. Nearing the end of your orthodontic treatment you will be seen again on the joint clinic to make sure the team are happy with your progress. Debond or removal of your orthodontic appliances: here you will be given retainers to wear which remind your teeth to stay in the position that the brace has left them in. These retainers will also have teeth on them to fill any spaces you might have after treatment. Review on restorative clinic 3-6 months later to arrange for something more permanent to fill the space where you are missing your tooth or to reshape your teeth is this is required. A new orthodontic retainer will them be made for you which fits snugly over all the teeth including the replacement teeth and keeps them in position over the long term. 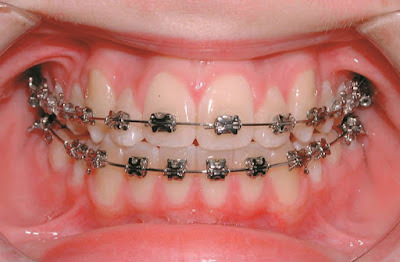 More information on what to expect from orthodontic treatment can be found here.